This katydid came whirling to the ground like a loose leaf. Perhaps it was approached by a cuckoo bird intent on taking it as prey. South Nandi Forest, Kenya. April 2013. Insectivorous birds, by design, do not eat leaves. By resembling a leaf these large Katydids might go unnoticed by hungry insectivores as they themselves feed upon leaves. But the birds are also very hungry and very keen-sighted. 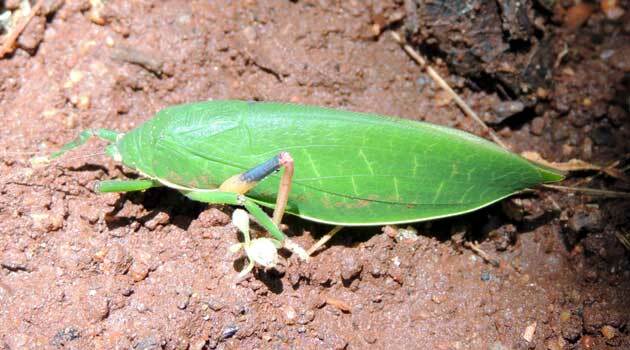 Once a katydid's disguise has been detected it has a few more tricks available for defense: it can fly, it can jump, it can bite, and it can kick with sharp spurs. This one was seen whirling down like a loose leaf from the forest canopy and not under its own power. When we see insects and birds in the field we get a snapshot of their interactions on many time scales at once.